I already wrote about 7 eco-friendly saving tips. There are countless things you can do that will help the environment and save you money. Here are 15 more eco-friendly saving tips that should save you money and help save the environment. ECO-FRIENDLY: Don’t buy multipack snack packages for things like potato chips, gold fish, cookies, etc., including those 100 calorie packs. You are being (over) charged for the packaging and the per unit price is much higher than if you buy the economy pack and just portion out a serving size in a reusable container or baggy. ECO-FRIENDLY: During the summer, if you have air conditioning, use it sparingly and try to keep the thermostat at 78 degrees or higher. Each degree you are able to raise the thermostat, will save you 3–5% on air conditioning costs according the American Council for an Energy-Efficient Economy. Drop your thermostat in your house down to 60 degrees in the winter. For every 1 degree you drop your thermostat, it drops your bill by 3–5%. Dress in layers inside and use those sweaters and sweat pants and add extra blankets to your bed. ECO-FRIENDLY: Re-use the plastic bags they give you for your groceries as a liner for your trash containers in your bathroom or other waste basket at home, or use it as lunch bag to carry your lunch to work, or to hold small items. ECO-FRIENDLY: Take shorter showers and switch to water saving shower heads and reduce your water bill even more. The average conventional shower uses 7 to 10 gallons per minute; a water saving shower head, 2 to 4 gallons per minute. If you take a 10 or 8 minute shower, switch to 5 or 4 minutes. To be even more extreme, take a short cold shower instead of heating the water and save on your heating bill too. Consider turning off the shower while you lather up. Try using a clock or timer to keep you on track. ECO-FRIENDLY: Turn off the lights. It seems like a simple and obvious practice, but how many of us leave the lights on? If you are leaving the room, it makes sense (and cents) to turn off the lights even if you are coming back in a couple of minutes. The average electric bill is $74.65/month. Lights account for about 11% of all energy used in a home, 9 % for computers and electronics, 9% for appliances, 8% for the refrigerator (Source: Dept. of Energy, 2007 Statistic). If you can reduce the use of your lights, you may realize some significant savings in your electric bill and your overall energy consumption. ECO-FRIENDLY: Replace your traditional incandescent light bulbs with compact fluorescent light bulbs (CFL). The CFL bulbs cost a lot more, but you will save about $30 per bulb over its lifetime and it will pay for itself in about 6 months. CFL bulbs use 75 percent less energy and last about ten times longer than an incandescent bulb. ECO-FRIENDLY: Buy surge protectors and save money and protect your valuables. Surge protectors protect valuables such as televisions, computers and stereos, and they provide additional outlets to plug into. But did you know that while our electronics are there seemingly sitting harmlessly, they are draining power and money from us needlessly in a mode waiting for us to turn them on. For instance, did you know that an average plasma TV when in standby mode (off) uses 1453.2 KWh of energy in a year? This is equal to about $150 per year in electricity! ECO-FRIENDLY: Leftovers, leftovers, leftovers. Approximately 25% to 40% of food in the U.S. is wasted each year by the food industry, families, supermarkets, restaurants and other business. An average family of four in the U.S. spends close to $7,000 per year on groceries according to 2007 USDA data and therefore a waste of $1,750 per year. Save money by using your leftovers. Make a second dinner, lunch or snack with your leftovers. Consider combining scraps of leftovers into a casserole and take them to work for lunch. ECO-FRIENDLY: Recycle your cans and plastic at a recycling plant or a participating grocery store. Many states charge 5 cents or more as a fee per bottle. This reduces your garage and the trash that will go to a landfill and returns you money. ECO-FRIENDLY: Forget the movies and go to the library. Go to the library and take out a free movie or book instead of going to the movies or renting. Make sure to return them on time or renew them before you receive late fees. ECO-FRIENDLY: Teach “Misertology” TM (made it up) or the art of being frugal. Teach your kids the value of money and how to save. This is a long term investment that will pay off big in the long run for you and your financially independent children. Play games that teach them how to count and manage money and other assets such as Monopoly. Have your child run a lemonade stand or other business at a young age. ECO-FRIENDLY: Drive a hybrid (gas and electric combination) vehicle. Hybrids get better gas mileage, lower emissions, and save you money on gas versus normal gas vehicles, although they cost more than traditional ones. Consider a vehicle that runs on biodiesel fuel, which is a clean, veggie-based, carbon-neutral fuel that works with most diesel vehicles. Check for the availability of biodiesel fuel in the areas you will be driving in, although it’s available in most states. ECO-FRIENDLY: Use that same cup over and over for drinking during the day. This will save on water, soap, waste, and time. Give it a quick rinse after each use and you can store it in the refrigerator with a cover to combat germs. ECO-FRIENDLY: Get rid of the clutter for charity or for sale. Consider donating clothes and other items to the Salvation Army, a woman’s or homeless shelter, or other charitable organization. Your contribution may be tax deductible and you are helping out others directly. How about holding a garage or yard sale or use EBay and get rid of all your unwanted items. But beware of the prep work which may lead you to not getting around to the sale itself. 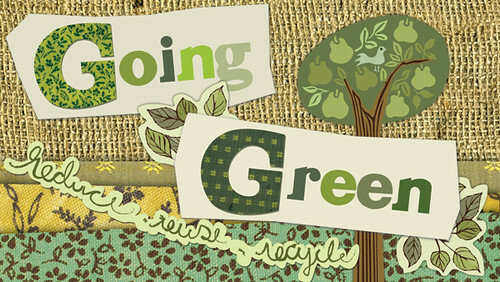 By “recycling” your items instead of putting them in the trash, you are helping to manage waste. ECO-FRIENDLY: No more greetings cards. Greeting cards act like an additional tax on your gift and they waste paper. Say it in words in person or via an e-mail greeting card or consider a hand written note or handmade card. With many greeting cards at $4 to $5 per card, your household could save $120 to $150 per year if your household purchases the average of 30 greeting cards a year. Some put the estimate at 50 greeting cards per person! Did you find this helpful or interesting? Looking for other ways to save? Have any eco-friendly saving tips of your own? Are you going green? Please write a comment below. This entry was posted on Wednesday, April 7th, 2010 at 6:17 am	and is filed under Automobile, Frugality, Going Green, Miser Mentality, Personal Finance, Saving Money. You can follow any responses to this entry through the RSS 2.0 feed. You can leave a response, or trackback from your own site. All great ideas. For me, I love the thought of looking at greeting cards. What the heck, I obviously have a computer, why not spend a little time creating my own cards. A picture, my own sentiments, perhaps a better grade of paper and some envelopes and I could save a good bit of change. Made me think! Denis, glad this made you think. I hope that others will also be encouraged to do the same.